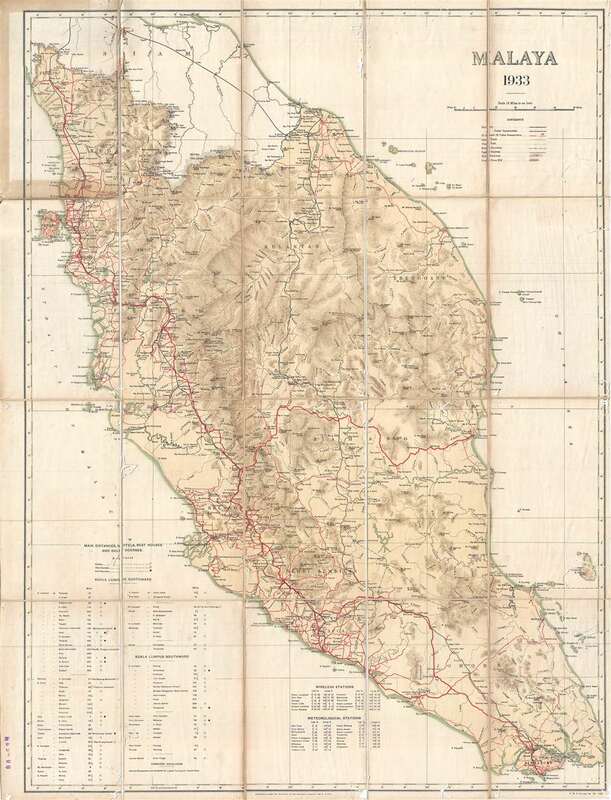 A very rare 1933 map of Malaya, modern day Malaysia, issued by the surveyor general of the Federated Malay States. The map covers the Malay peninsula from the Thai / Siamese border to Singapore. This is a topographical map drawn to illustrate the region's developing road system. Roads, both extant and under construction, are highlighted in red. The map also details railway lines, cart tracks, light railways, and state boundaries. Hotels, rest houses, and golf courses are also identified. A table in the lower left identifies distances from Kuala Lumpur, wireless stations, and meteorological stations. This map is quite rare. We have been able to identify only one other example in the collections of the National Library Board of Singapore. Federated Malay States Survey (1922 - 1945), better known as the F.M.S. Survey Department, was established in the early 20th century to produce detailed surveys of British Malaya and the Straits Settlements. The survey department had offices in most major Malayan ports, including Singapore, Kuala Lumpur, Penang (Georgetown), and Malacca. They were the first official survey organization to publish detailed scientifically produced maps of the region. Good. Some worm holing evident in photo. Some discoloration in upper left quadrant where originally attached to binder. Discoloration and wear on original fold lines. Attached to original binder. Front cover detached but present. OCLC 244419931. National Library Board, Singapore, Lee Kong Chian Reference Library, English 912.5951 FED.